Hello Friday! 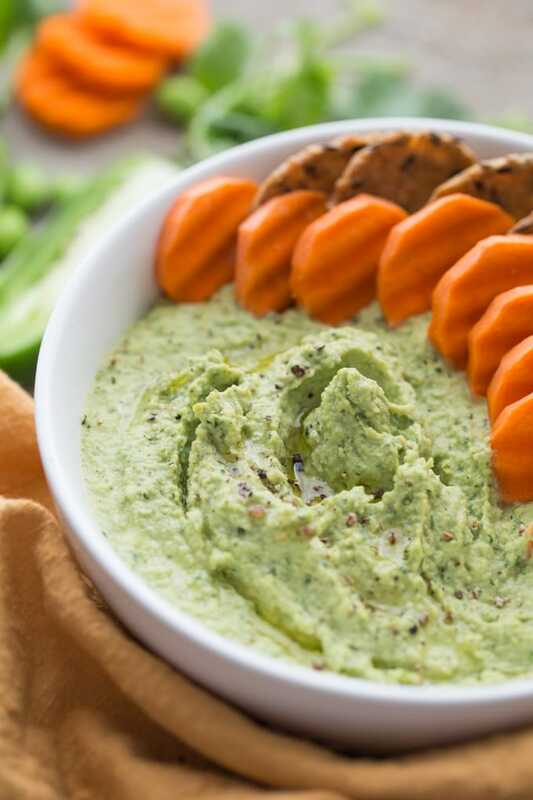 The first weekend of 2018 is calling out for you to make this clean and green Cilantro Jalapeño Edamame Hummus! Hey there! Happy New Year! How were your holidays? I can’t believe Christmas has come and gone for another year! While it was only a few days ago that I posted my Top 10 Recipes of 2017, it feels like such a long time ago. Perhaps it’s the return to work and getting back into a routine, but it’s been a busy week. Plus, I’ve been recipe testing like crazy in the kitchen! If you follow me on Instagram, you know I’ve decided to go clean and green during January. Wait, you say, don’t you already eat clean? Why, yes I do…..about 80% of the time! But around Christmas, it definitely dips below this. I enjoy balance and moderation, and my body definitely tells me when I’ve gone too far. And right now, my body is craving simple meals and lots of fruits and veggies! I’m betting a few of you feel the same way…..
That’s why I’ve decided to make it my goal to include greens in each and every meal during the month of January. So far, this spicy salmon salad has been on the menu as well as a few other recipes I’ve been testing. But my biggest challenge is breakfast, since I’m addicted to peanut butter and chia jam toast! Over the past few days, these breakfast sandwiches with kale pesto and spinach have been a life saver! So to help me along (and hopefully you too! ), every recipe I post on Crumb Top Baking during January will incorporate green veggies and/or fruit! And I’m starting with this Cilantro Jalapeño Edamame Hummus. It’s loaded with edamame and cilantro, with a kick of jalapeño peppers. I know, this is all pretty obvious from the recipe title, but you get the point. It’s all green veggies, my friends! And it tastes pretty darn delicious too! Hummus is a staple in our house, especially homemade, like this red pepper arugula hummus. This recipe is usually whipped up in my food processor every other Sunday for weekday lunches and snacks. While this recipe has a summery, snacky feel to it, I promise there are some warm and cozy dishes in the mix, lots of fresh salads, and maybe even a breakfast or two! 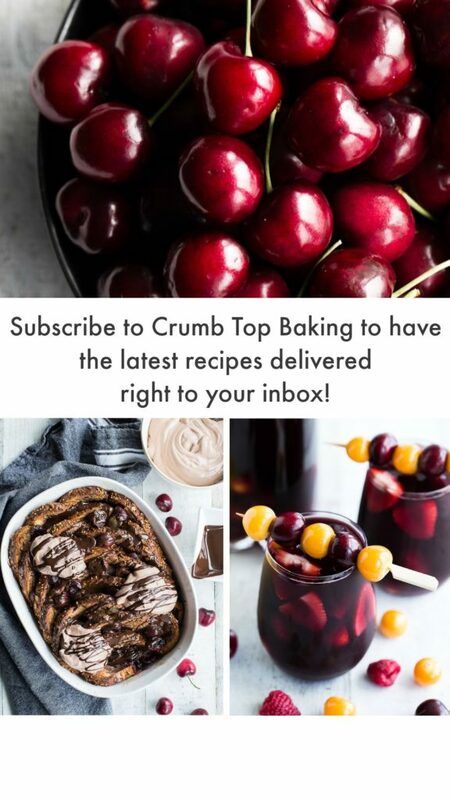 If you’re interested in joining in this clean and green challenge, follow along here at Crumb Top Baking for the latest recipes, or on Instagram at @crumbtopbaking! 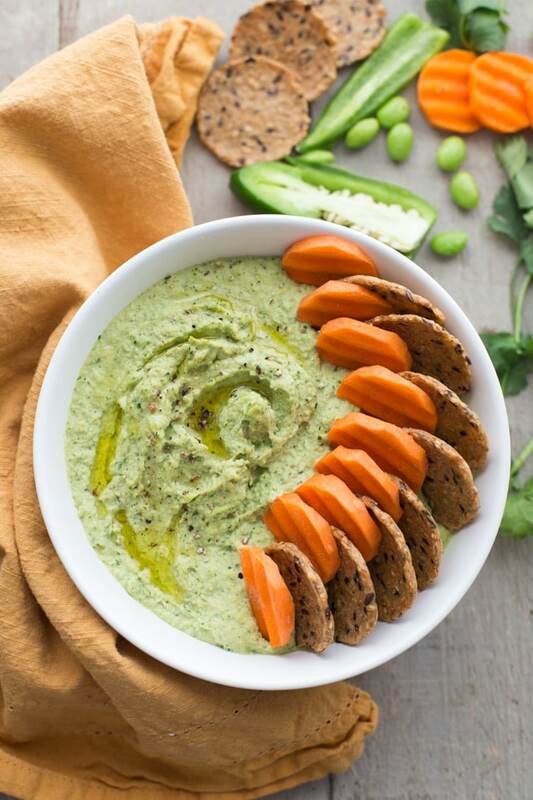 Cilantro Jalapeño Edamame Hummus is super creamy and loaded with edamame and cilantro, a hint of lemon and jalapeño pepper, and the usual suspects of tahini, olive oil and garlic. Add all the ingredients to a food processor and process on high until the mixture is smooth and creamy. You may need to stop occasionally to scrape down the sides of the bowl. Scoop into a bowl and drizzle with additional evoo and a sprinkle of pepper. You can serve this with veggies, pretzels and crackers, or use as a spread for sandwiches or wraps. Store any leftovers in an airtight container in the refrigerator and enjoy within 3-4 days. I use frozen edamame and cook it according to the package for 3-4 minutes. I’m definitely not afraid of a little spice (or a lot, really). Yay for clean eating in January. Like you, hubby and I eat healthy most of the time anyway and really enjoy it! Hummus is a staple in our home too and once you make it from scratch there is no buying it from the store again. 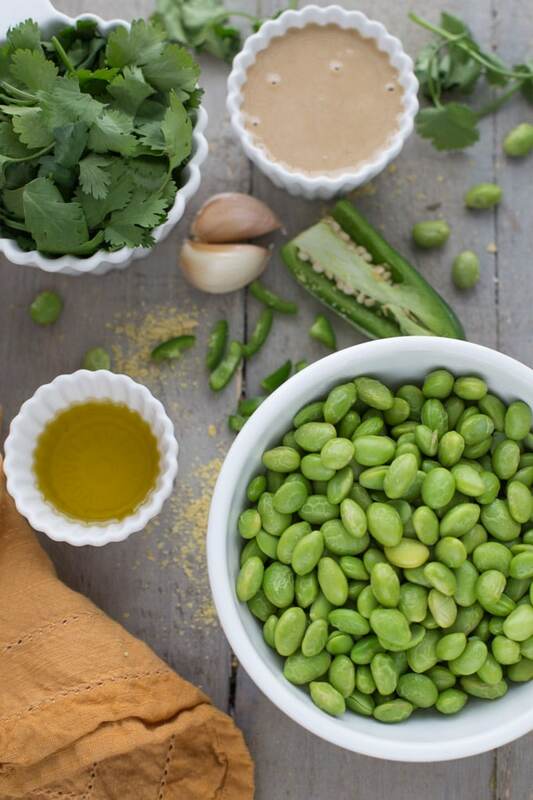 Love this flavour packed edamame version…that’s what I call yummy weekend eats! Have a good one! Thanks Dawn! You are so right! Once you make homemade hummus, you just can’t go back to store-bought. This edamame version is on repeat in our house right now. Hope you’re having a great weekend! I could eat hummus for every meal and never get tired of it. This looks INSANELY good, Leanne! Like, it’s pretty much all I’m craving today! Happy Saturday! Thanks Kelsie! I’m with you. I never tire of hummus. It’s perfect for meals or snacks, and it’s so easy to make! Hope you’re having a great weekend! Thank you so much for this recipe. I am 100% making this when I’m back from Brazil, or if I can find edamame in Brazil (I don’t remember ever seeing it there). Thanks Camila! I hope you like it! If you make it, please let me know how it goes. Enjoy Brazil! This is so pretty! I love edamame but will have to switch out the cilantro for parsley…. (Yep, I’m one of them!) This is a wonderful idea for hummus! Haha! Thanks Annie. I used to have an aversion to cilantro, but over the years, it has grown on me. Now I love it! If you try the hummus with parsley, let me know how it goes! 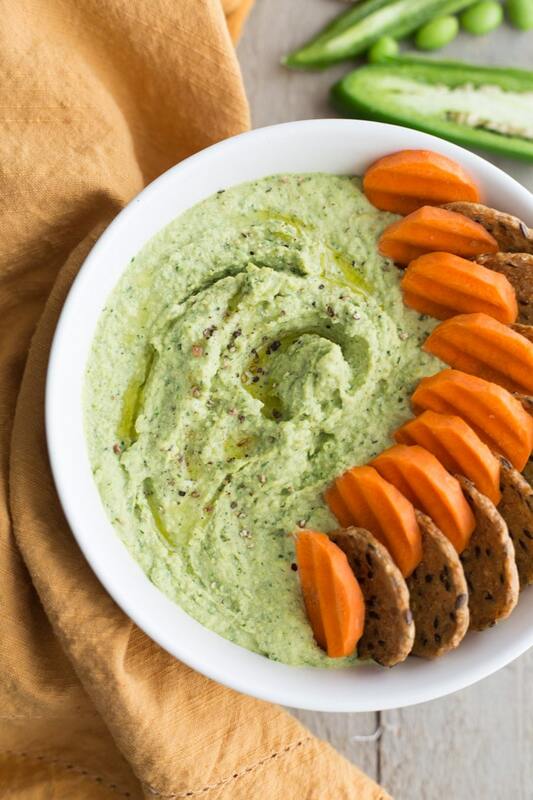 Such a great idea to add greens to every single meal during January, that is a great goal…this hummus by the way is a must try, it sounds and loooks so good! Wow. This looks delicious and perfect for snacking. 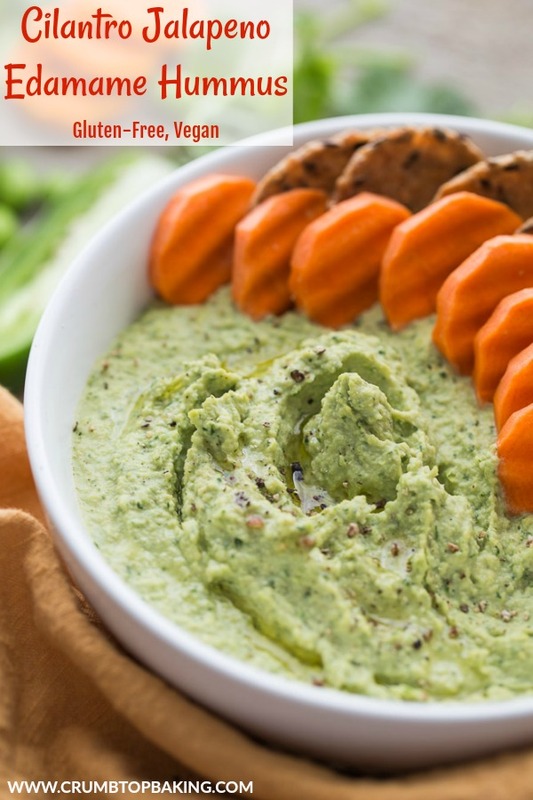 I’ve bought the pre-made edamame hummus and really liked it so I can’t wait to try it using your recipe! Thanks Amy! Edamame in hummus is great! If you try the recipe, I’d love to hear what you think. Enjoy the rest of your week! You know what is so perfect? I actually have a 1/4 of a jalapeno leftover in my fridge, haha! It’s meant to be. I’m definitely craving all the veggies and clean eats this January too – December was way too indulgent for me!! This looks amazing – it would be so good with some toasted pita!! Thanks Katherine! It was definitely meant to be! I love the idea of serving it with toasted pita. Must try! What a fabulous idea! I have some pretzels in my cupboard that would go perfectly with this! I’m adding it to my “must try” list. Oh yes, pretzels are perfect with this hummus! Let me know what you think if you give it a try! I love snacking on edamame! 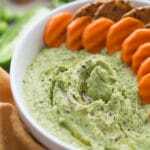 And I would love this edamame dip with that little spicy touch! The color is beautiful too, which is a bonus. And the addition of nutritional yeast is very interesting. Makes me want to start dipping 😉 . Thanks Nicoletta! We like our hummus a bit spicy! And I’ve been adding nutritional yeast to different recipes lately just for the subtle cheesy flavour. Enjoy the rest of your weekend! I’ve made hummus from a lot of different veggies, but never with edamame. Now I need to try this! Thanks Colleen! Hope you get a chance to try it. I love edamame in hummus! It adds a nice, thick texture. Be sure to let me know if you make it! Thanks Nicole! I tried edamame in hummus when I needed a break from chick peas! It’s a nice change, and now it’s pretty much the only hummus I make! Happy Sunday! Do you need the yeast? Hi Ashley. No, the nutritional yeast is not essential. It adds a cheesy flavour but if you want to leave it out, or sub in some parmesan cheese, that totally works too. Thanks!